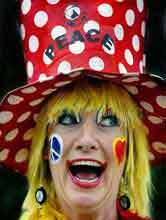 I am a World Peace Sustainability Clown, and my name is Peacefull or Peace Fool (depends on my mood ha). 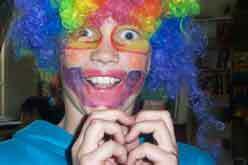 I felt inspired to become a clown. I clowned on the streets, hospitals, schools, orphanages, nursing homes, festivals, business meetings, conferences and have given many talks about the the art of clowning and how it naturally links with feelings of peace, joy and love. 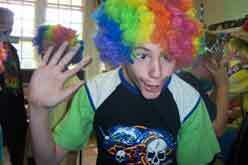 Through the eyes of children, clowns are fun, happy and full of surprises. The clown shares with children a magical world where life is full of excitement, joy and hope. Laughter and happiness is healthy, as you laugh your body releases endorphins through the body, these are happy hormones that make you feel good and invigorated. As we laugh together we feel a sense of connection with others in our community. 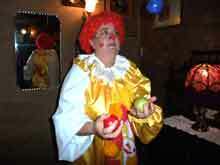 The clown has been around since antiquity and has featured in most if not all cultures. Clowns are known for their ability to make people laugh, to distract them from their sorrow and to remind them that we are here to smile and have fun. The clown feels an innocence and sees the world through smiling eyes where every person is wonderful and acceptable. There are no exceptions. Just imagine if people believed it. The only thought of a clown is to bring a smile to the world, and if a person is very sad, the clown will seek to uplifted him or her in some way, even if that means just smiling and allowing that person to be alone. A clown never deliberately imposes their presence on anyone, everyone is free to smile or keep walking. The clown sees everyone as equal and does not distinguish people by age, gender, culture, how they look or whether they are wealthy or not. Each person is an opportunity to display joy and simply laugh and play. Perhaps you are a clumsy clown, a busy clown, a juggling clown, a trickster clown, a buffoon or fool, know that life is the circus. What we see in others is in ourselves. That’s why we can see. The clown reminds people not to take themselves too seriously or we may miss the point of why we are all here…we may overlook solutions when we focus on what is wrong, rather than what works. So why not be a clown and enjoy life, liberty and genuine happiness…. the greatest power we have is to realise we might be wrong and laugh at ourselves. This is the beginning of wisdom (yee ha). The clown in the purist form is love and the essence of this is to simply let life and let go. Here’s a joke – Q. why shouldn’t you iron a four leaf clover…. (give up…) A. you don’t want to press your luck!! In day-to-day life many people don’t have time to be silly or it is considered frivolous, however clowning is a great way of just connecting with that inner child and remembering the happiness is waiting to come out behind every facade. 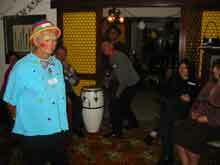 I clown with organisations and demonstrate the fun of clowning, I teach Clowning Around (find your inner clown). Other wellbeing workshops include: Happiness 4 Life, Laugh Out Loud, Humour, Positivity and Healing. 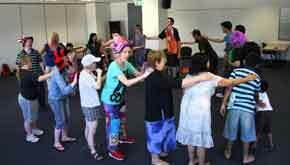 The workshops help people to release stress, allowing people to play and be themselves. Everyone feels uplifted by the time they leave. That is my joy. 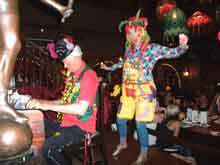 If you are interested in clowns at your event go to Peace Clowns or workshops Funny business. Anyone can be a clown and each of us have a clown inside. 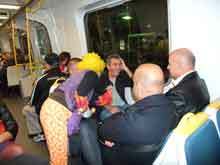 Just work out what sort of clown you are and express yourself… don’t be shy. Clowning is about loving yourself enough to shine and naturally you will feel it for everyone. The first thing a person does when they win the lottery is shout everyone, just imagine if you felt like that every day. We would live to give. When you live by example it gives people permission to connect with each other and be themselves. The purpose of life is not money it is happiness, yes! I had to laugh, one of my friends has told me she is changing her name to Joy. She is one of the happiest people I know yet she lives in considerable pain that can leave her bedridden for weeks. She keeps smiling as joy comes from within. Wow. I had the pleasure of meeting the staff at Chulalongkorn Hospital, Bangkok, Thailand. 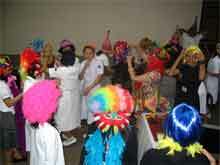 This was the first clown workshop in Thailand and the first time they had been with a clown. 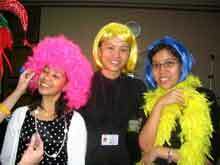 They loved going to outpatients and meeting the public and patients. There was great excitement wherever we went and you could see the happiness in their eyes. 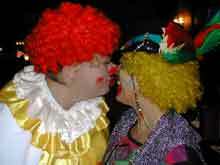 We clowns believe that humour can heal. We’re all big kids at heart, don’t hold back. Let life live you. 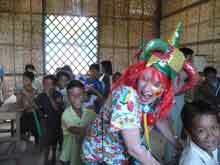 I am clowning with children in a slum in Cambodia. This was their first experience of a clown. They didn’t need anyone to tell them what a clown is, they knew a clown is fun. They were great kids and quick to join in for a few games. We walked through the slum and met the community, threw squishy balls into the crowd, played music and juggled. The people threw the balls back with a smile. I juggled and laughed all the way, we didn’t need language to say hello. One child was so overwhelmed that he chased our car as we left. We were all happy in the car and noticed the little boy was still running, he ran for a long time. Amazed, I reached out the window and our fingers touched. He just didn’t want the clowns to leave. I reached into my bag and grabbed a puppet, I reached out the window and the little boy took the puppet and stopped running, my last memory of him is just staring at the puppet, overjoyed. He had something to remember that the clown was not a dream. In that moment I realised that peace between people was about connection and empathy. His love touched my heart, my love touched his heart. It was one of the most beautiful moments of my life. My greatest teachers have been children, they are quick to smile and they don’t need a lot of encouragement. These children learned that REAL HOPE is responsibility, empathy, awareness, love, honesty, oneness, peace and enjoyment (see REAL HOPE program). The last one they particularly embraced. Children have the ability to see the world clearly and their questions are very thoughtful and honest. They are trying to make sense of a complex world with mixed messages. If they can hold onto their humour and look for the good in life, they will feel happiness that makes life worthwhile. If we wish children to be happy, they will learn it from us. This was written by one of my dearest clown friends – Hairy Potter clown. He is a wise ‘ol clown and I think he found the answer in cooking. 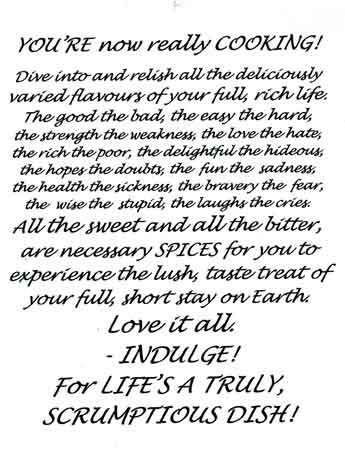 Life has many flavours and we are here to experience it, dive in and hug the differences as the friends we are yet to know. Having a joke is light relief and reminds us that life is truly gorgeous. Here is some good jokes to share with friends. What did the dirt say when it rained? If this keeps up, my name’s mud. Would the Standing Committee please sit down? I can resist everything except temptation. Oscar Wilde.